These beautiful chrome lug nuts are a must for your custom wheels. Durability and beauty are a given thanks to the triple chrome plating. Very easy to find rare products. Web site very easy to use and showed me just what I needed. They are a perfect fit. I wanted to put factory Toyota wheels on my 07 classic GMC 1500 pickup and was told it can't be done. Your lug nuts accomplished this perfectly. Thanks much! Product was exactly as decribed and worked perfecfly to install Toyota FJ wheels on a chev 4X4. Delivery was also quick. 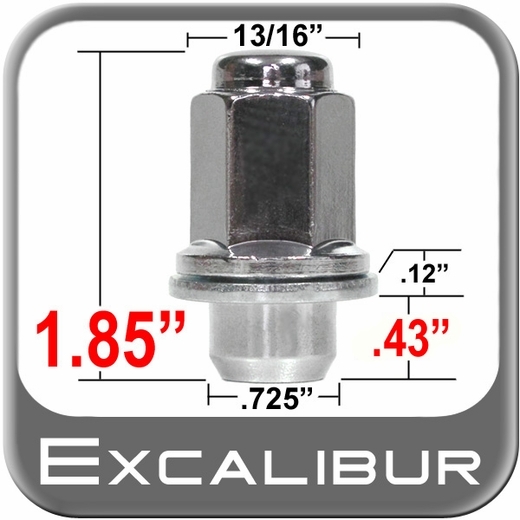 These lug nuts are what is needed to use Toyota BSS six spoke wheels on a GM Product, I used them on my 03 Yukon! Just the right part to put FJ wheels on a GM vehicle. Best price anywhere and shipped extremely fast. Friendly people when ordering something or exhanging an item (Eric). Knows what they are doing (Eric).